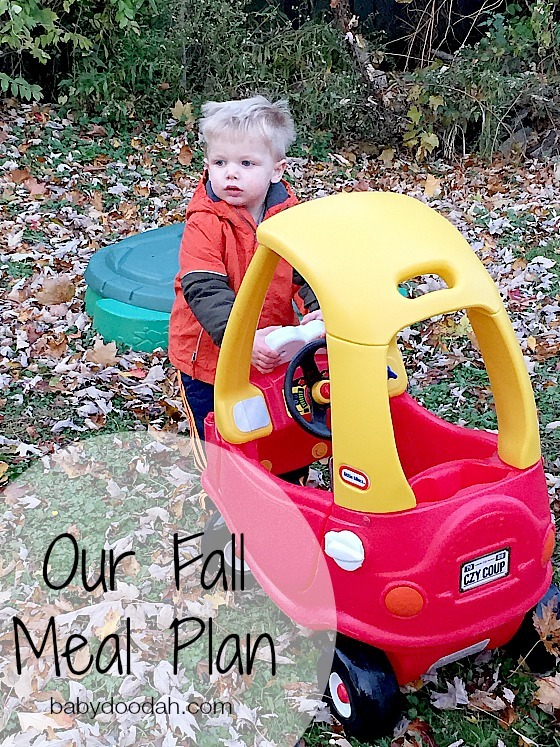 Let's Meal Plan - Baby Doodah! Happy Monday! I truly mean that, too. I am off both today and tomorrow and couldn’t be more excited!! However, despite being off, we are still making our meal plan, it’s our easiest way to save money and not go off the rails when we’re grocery shopping. Ours was pretty good! Saturday we spent a good deal inside, going between watching movies and cuddling to play with cars and trains – oh and of course being loud!! haha Yeah, Emmett’s new thing is to shout everything, even when he’s singing. It’s a good thing he’s cute! In the morning, I did get to go for a Pedicure with a friend and then out for brunch. Boy did my feet need some TLC. Sunday, was equally as easy going. Since we have today and tomorrow off, we decided to hold off on grocery shopping until today. So, instead of needing to rush out the door to the store, we all enjoyed breakfast together and then Emmett and I headed out to do some shopping. I had intended on going to a few different stores, but Emmett had a different idea, we only made it to JoAnn’s and Trader Joe’s – better than nothing, I suppose. After nap time, Seamus went to the gym and Emmett and I played outside. Our weather was decent, chilly but dry, so we pulled out his Little Tikes Cozy Coup (affiliate link) and rode it around the neighborhood. He was in heaven! Of course, after our walk we had to take it in the backyard, where Emmett tipped the car no less than 3 cars. haha He was so muddy, but he was having a blast, so WHO CARES!? The rest of the evening went by in a blur, we had dinner, finished watching a movie we started on Saturday, gave Emmett his bath and then it was to bed. What an awesome whirlwind of a weekend! That’s a seriously yummy week, right there!! If you share a meal plan on your blog, you should join me at either Mommy, Run Fast or jillconyers.com! Link that post up and make some new friends. How was your weekend? Do anything fun!? Yes, that IS a seriously yummy week right there!! Your weekend sounded nice and laid back! And I think that’s impressive that you were able to make it to two stores, I consider that a success, haha! We had a laid back weekend over here too, those kind are always my favorite. I hope you have a good two days off! Hi Jessica!! I do a pretty good job of bribing my son. lol Maybe I shouldn’t, but when he starts to whine about being in the cart for too long, I give him a small toy (something in the 2 to 3 dollar range) and then just buy it for him. That probably reinforces behavior, huh? Oh well – a mom’s gotta do what a mom’s gotta do. Thanks for stopping by!